The musician-turned-politician looks set to shake-up Ugandan politics thanks to his young support base and message of power to the people. But can he maintain his momentum three years out from the next election? From the moment pop-star-turned-politician Bobi Wine stepped off the plane onto Ugandan soil on Thursday last week, barely a day has gone by where he has not been surrounded by a throng of supporters and local journalists. Bobi Wine — whose real name is Robert Kyagulanyi Ssentamu — had just returned from the US where he received medical treatment following alleged torture by members of Uganda's presidential guard after his arrest at a political rally in August, leading to violent protests in the capital, Kampala. Since then, Bobi Wine's support base has gone from strength to strength and he has been widely recognized, both at home and abroad, as a serious threat to President Yoweri Museveni who has remained in power for 33 years. Amid the excitement of Bobi Wine's return to Uganda, police banned all "unlawful rallies, processions and assemblies." Bobi Wine, who now faces charges of treason, has rapidly built up a following based largely on his message of power to the people and criticism of the government after he was elected in a parliamentary by-election last year. "Officials from the Ugandan government have always been trying to project a picture that Uganda is a democratic country," Bobi Wine told reporters during a press conference on Monday. "For so long, the rights of people have been abused, people have been brutalized and many killed and it has always been conveniently concealed." Bobi Wine waves to supporters as he gets into an ambulance after being released on bail. His trademark red cap has drawn comparisons with Julius Malema's Economic Freedom Fighters party in South Africa. A long road to power? But while Bobi Wine has certainly made waves in Uganda in recent months, among all the enthusiasm it's easy to forget that the next election is still three years away. Following an unsuccessful attempt to oppose the removal of a clause in the constitution which prevents anyone over the age of 75 from holding the presidency, Museveni remains eligible to run for yet another term in 2021 and could continue to rule the country into the 2030s. Ben Shepherd, a consulting fellow in the Africa Program at Chatham House, thinks it's too soon to determine if Bobi Wine has what it takes to unseat the longtime ruler. "We don't yet know if he's capable of putting together the kind of organization that will be needed to draw in the fractured and disparate bits of Uganda's opposition," he told DW. "He would need to develop his political message, develop his campaigning organization." But researcher and analyst Frederick Golooba Mutebi believes that Bobi Wine's ability to connect to ordinary people though his musical background could serve him well in the long-run. "Him being a musician and therefore having derived his popularity from music and being known across the country, that makes him quite a potent force for the government and the ruling party to reckon with," Golooba told DW. Bobi Wine stands on his car, surrounded by supporters. Uganda's young and disenfranchised youth make up the majority of his support base. The self-styled "ghetto president" owes much of his support to a growing population of educated but unemployed and disenfranchised youth who are expected to shape Uganda's political future. With 77% of its people under the age of 30, Uganda is one of the youngest countries in the world. Known as "Museveni babies," these Ugandans have known no other president. To them, Bobi Wine represents a breath of fresh air and a chance to make their voices heard in a political landscape long-dominated by the older generation on both sides. "If you look at the history of Uganda in the last decade, the opposition has not really succeeded in building momentum or a great deal of popular support," says Shepherd. "In part, that's because they're from the same generation and the same background as Museveni." Golooba believes that Bobi Wine's real challenge will be to look beyond the young demographic for support and appeal to traditional Museveni voters. "I think the people who have been running towards [Bobi Wine] so far have been those who are opposed to Museveni anyway," says Golooba. "Whether he is going to be able to take some of Museveni's supporters away from him will depend on how he goes about opposing the government and what kind of language and approach he is going to use in appealing to them." Regardless of whether Bobi Wine manages to achieve this, it appears highly likely that a major political shake-up in Ugandan politics will take place in the near future. "If it's not Bobi Wine, then it will be someone else," says Shepherd. "I think the tidal wave of Uganda's demographics, and the way the economy is structured lends itself very clearly to political mobilization." Museveni is certainly aware of the growing gap between Uganda's large young demographic and the older generation. Earlier this month he even went on a tour of-sorts to Kampala's slums, speaking with young people and handing out checks in a possible attempt to lure back the youth vote — although a government spokesman later claimed they were nothing more than a "symbolic" token of goodwill. But while Bobi Wine is hugely popular with young people in urban areas, Museveni still enjoys the support of rural voters who remember the difficult life they had under previous presidents and the horrors of the Ugandan Bush War. "There is still a well of support for Museveni and the ruling National Resistance Movement (NRM), remains by far the best organized and largest political organization in the country," Shepherd says. "And he still retains the loyalty of the security services and the police, although some cracks have begun to emerge in recent years." Even so, Shepherd believes the rapid success of Bobi Wine is a signal to the NRM that their control over Ugandan politics may not be as strong as it once was. "It's a very important sign that the old model that Museveni has used to govern Uganda for [decades] is under a great deal of stress." Alex Gitta contributed to this report. 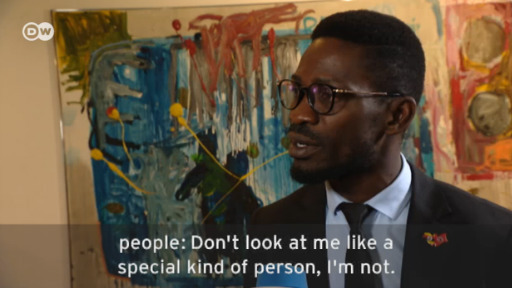 Popstar turned politician Bobi Wine is an outspoken critical voice in Uganda. As a threat to the power of President Yoweri Museveni, Wine has been arrested and beaten. Now he is planning a run for president. DW's Eddy Micah Jr. spoke with him in Berlin. 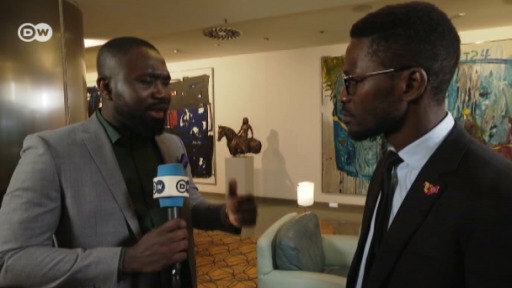 In an exclusive interview with DW, Uganda pop star and member of parliament Bobi Wine says and his team are ready to challenge veteran President Yoweri Museveni in elections in order to bring about a change of leadership after over 30 years.